There’s nothing cozier than sipping a warm gingerbread latte during a chilly day! This Whole30 Gingerbread Latte is super easy to make and uses minimal ingredients. Naturally free of sugar, dairy and gluten – it’s a festive treat than any one can enjoy if they’re looking for some fancier coffee! I am the type of person who can (and does) eat gingerbread all year round. I love the mix of sweet and spiciness that comes with it. It’s so perfect in cakes, cookies, and drinks – like this Whole30 Gingerbread Latte! 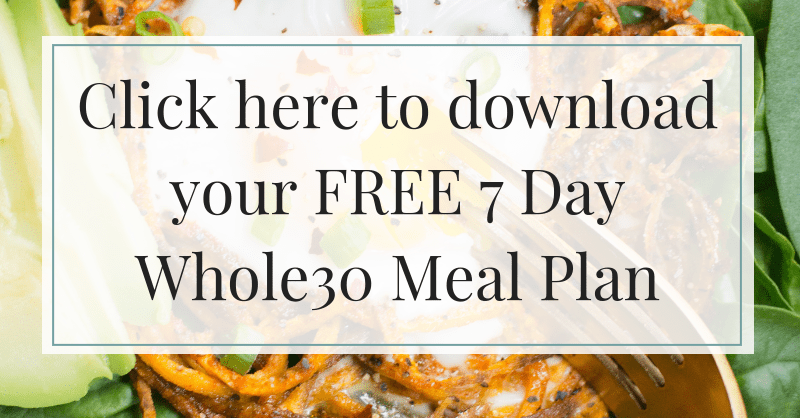 Before we go further… did you know I have a FREE 7 Day Whole30 Meal Plan? Click here for the details! What makes this Whole30 Gingerbread Latte healthy? Dairy free- Using almond milk in this latte helps keep it lower in fat, and gives it a rich taste with no dairy necessary! Simple ingredients – This latte is made with just almond milk, spices + espresso! This time of year is traditionally filled with tons of treats and LOTS of sugar. Which is totally fine – don’t get me wrong. I love cookies just as much as the next person – and typically I eat a bunch of them even though I know they are not the best thing for me! The way I see it.. you only get to have these things once a year. Why should you deprive yourself of the things you love?! I do, however, try to be mindful about just how much sugar I’m intaking. I’m the type of person who doesn’t like to ‘drink’ my calories. Mostly because I don’t like drinking super sweet things, but also because I’d rather eat a cookie than drink something from Starbucks. If I’m going to enjoy something, I want it to be made with high quality, delicious ingredients. That’s why I came up with this recipe! I used to loooove Starbuck’s Gingerbread Latte’s. I would get them basically every day during the holiday season. When I switched to eating healthier and tried one a few years back.. I couldn’t stomach the sweetness! Even ordering it with half the syrup or a lower fat milk.. it was just TOO sweet for me, and totally hurt my stomach. So I made my own dairy & refined sugar free version that only has 6 real food ingredients. We love it at our house and I think you’ll love it at your home too this winter! Looking for other cozy drink recipes? Try these! This Whole30 Gingerbread Latte is paleo, refined sugar free + easy to make! Simply delicious + a much healthier version of Starbucks holiday drink! Warm almond milk in the microwave or stovetop until it is at your preferred temperature. In a blender, add almond milk and spices and blend for approximately 30 seconds until everything is thoroughly combined. Pour into a mug + top with espresso. If you're not doing a whole30 - you can add maple syrup to this to sweeten it. I recommend 1/2 a teaspoon. You can make this an iced latte simply by not heating the almond milk on the stove. Hi Kyla – Crazy, right?!! Definitely give this one a try! !